This week I've been thinking about choosing colour for my stitch along stitching, personally I think blue is one of the obvious colours, but as you can see I've got lots of blues to choose from! However blue is not the only colour choice and there have been some lovely colourful examples of the March Stitch Along pattern appearing in the Embroidery pool. I particularly like ticklepea's take on this month's pattern, as she's used the alphabet Corvus provided, as a basis for a sampler. And talking of colourful, how's this for a colourful octopus? 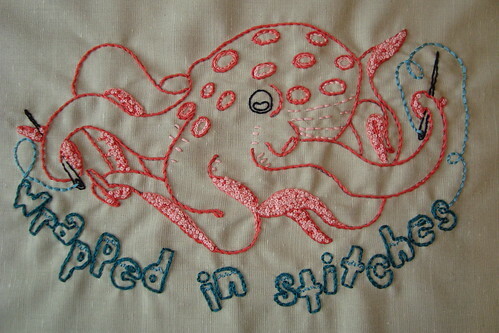 (And I love the phrase stitched out). Some great work is beginning to appear in the embroidery pool and I'll be doing a full round up at the end of the month. Meanwhile it is not too late to have a go at this pattern, you can find the pattern link in this post here or if you search on Flickr under the tag MarchStitchAlong. 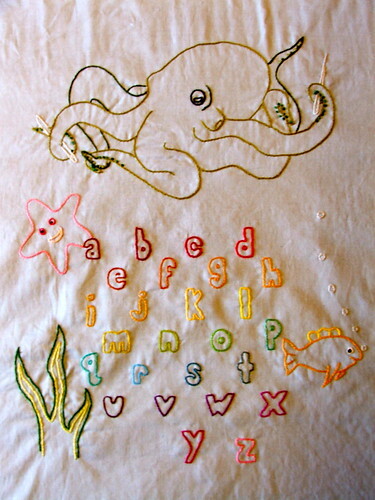 What great stitcheries! I love the variety that comes into play when everyone puts their own creative spin on a pattern. What fun! Thanks for the fun stitch along!!! I definitely wanna do the next one too- can't wait!! !